3 You brought me up from the grave,O Lord. If you've been following this adoption journey, you know how excited we were to adopt Sergey, or as we had planned to name him, John Sergeant. We were devastated to find out that he was not going to be ours, but we knew that he was going home to a family member and that gave us great comfort. We have felt an incredible sense of peace, the peace that passes understanding, as we grieve the loss of the hopes and dreams we had for Sarge to be a part of our family. We KNOW that God sees the bigger picture and it seems that he has begun to reveal that picture to us rather quickly. Many months ago, I received an email from a stranger named Lisa. She had learned of our adoption plans and was hopeful that she and her husband would adopt a child with Down Syndrome from Eastern Europe. As we emailed back and forth, she told me that they had been considering a little boy named Kirill from Eastern Europe. I was THRILLED for them. Kirill caught my eye back when we were pouring over pictures and trying to decide on what child we would adopt. We did not consider him seriously because he was a little older than what we thought we wanted at the time. (*Side-note: As we have traveled this journey, God has really changed our hearts and opened our minds to many different possibilities for our family. When we first started, we were pretty adamant that we didn't want to change Clayton's birth order. But that has become unimportant to us as we have prayed and studied about God's heart for orphans. We want to have the same heart as him, and we just don't feel that birth order is that important to him. This is a personal decision, and I definitely understand concerns about changing a child's birth order through adoption. I'm not judging anyone else if they decide they don't want to change birth order, but for us, it has become an unimportant factor). Back to Lisa...so Lisa and I emailed and we even talked about the birth order thing because if they adopted Kirill, he would be older than their daughter. When Lisa told me they had officially committed to Kirill, I was so happy for them (and even a little jealous). ;) Kirill was just so cute! We continued to email and make our plans to travel to meet the child to whom we had committed, bouncing questions about travel off of each other. Lisa truly seemed like a kindred spirit to me and it felt like we had known each other for our whole lives. Sometime between Thanksgiving and Christmas, I got a really sad email from Lisa. She told me that they were not going to be able to adopt Kirill. Her pain was palpable. I knew from her words that the decision was a heartbreaking one for her family. I knew that she was so disappointed and I just hurt so much for her. As Christmas approached, our family decided to forego the typical gift-giving fiasco and donate our Christmas gift money to a child or maybe two children from Reece's Rainbow. Kirill was one of the children we picked, along with another one of our favorites, Victoria. We got two Christmas ornaments from Reece's Rainbow, one with each of their names on them. Kirill just kept tugging at my heart and I even told Greg that if he was still available after we got Sarge home, I wanted us to seriously pray about adopting Kirill too. Since I look at the children on Reece's Rainbow often, Greg just kind of laughed and told me that we should probably worry about getting Sarge home before we started committing to other kids. But for some reason, a reason that we now understand, Kirill was always in the back of my mind. Fast forward to this past Tuesday, March 16th. I was out running errands with Clayton and had left my phone in the car when I went into a store. When I got back to the car I had a missed call from our adoption agency. I was SO EXCITED. This was it! We were getting our travel date, I just knew it. So I called them back and when our social worker answered, her voice was so sad as she said, "Tesney, we have received some devastating news about Sergey." After those words, I don't think I heard another word she said. In a matter of seconds I went from the highest high to the lowest low. Later, after Greg called back to clarify, I realized what she had explained to me on the phone. In Sergey's country, law requires that all of the first line blood relatives of a child have to sign off on an adoption. Not just the mother and father. This should have been done before Sarge was referred to the adoption agency, but it wasn't. So when the Minister of Education received our dossier, he or she had to contact them before we could get our travel date. At least one, possibly two, of those family members were opposed to him being adopted. Our social worker went on to tell us that the MOE had worked for a month and a half with the family member(s) and help them see the benefits of him being adopted by an American family. However, they were persistent that they did not want this to happen. Also, according to the law, if a family member opposes an adoption, they must take the child home or find another family to adopt the child. That gave us a lot of peace knowing that they couldn't just oppose the adoption and leave him in the orphanage. Still, we were absolutely heartbroken that Sarge wouldn't be ours. After a lot of tears and a lot of prayers, we felt so much peace. It was definitely the peace and comfort of the Holy Spirit. Greg and I decided that regardless of what had taken place with Sarge, we would press on with our plans to adopt. It never really was a question with either of us, but we just needed to reassure each other that we were o.k. to regroup and move forward with considering other children. Kirill was already in the back of my mind, so we decided to just go ahead and inquire about him. Our adoption agency was so positive about us moving forward with Kirill. Several factors seemed to be confirming that he was the direction in which God was leading our family. He will turn four years old in May. In most Eastern Europen orphanages, once a child with special needs turns four, they are put into an adult mental institution. Often, they cannot be adopted once they are transferred. Kirill is only about six weeks from his 4th birthday, so time was running out for him. He also is in a region that doesn't allow families with more than four children in the home to adopt, so that knocks a lot of families out of adopting from this particular region. We definitely met that requirement. We also loved the idea of him and Clayton being so close in age; we felt like it would be positive for both of them. Plus, let's just face it...Kirill is FLIPPIN' ADORABLE! On Thursday night, Greg and I spent some time talking and praying about Kirill. When we finished, we both felt that we just couldn't say no to him. We could save him from a lifetime in an institution with very little effort on our part. Our paperwork is relatively done and we met all of his region's requirements. So, we called our adoption agency and committed to adopt Kirill! I emailed Lisa and told her the news. She is so happy and I'm so happy that she will always be able to keep in touch with Kirill! It's just amazing the way that God has woven our stories together. Not only does she share our love for Kirill, but she can also relate to the loss that we feel for Sarge because she felt that loss with Kirill. We still feel very sad that we won't get to be Sarge's mommy and daddy. Over the past eight months, we have fallen in love with his picture and the idea of being his parents. To us, he was already a part of our family and we loved him with all of our hearts. We are still very much grieving over the loss of our dreams for him. But, we feel so much hope for our family and for Sarge's family too. We believe he can be a catalyst for change in his country as people see him with his family. We are hopeful that God is going to use him to change people's view of children with disabilities in Russia. He may very well save many children from a lifetime in an institution because their parents will see his family and say, "We can raise our children and not hide them away from society." It has been and will always be our pleasure to be an instrument in his story. If our role was to pray for him for a season of his life so that his family could find out about him, then we are so happy that we were given that chance. We will continue to pray for him and his family every single day. And now, instead of only one child finding their family, there will be two children who have found their families: Sarge and Kirill. pray and figure out what God has planned for our family. Get ready for a flood of emotion post that may not make the least bit of sense but is going to be very therapeutic for me because I'm trying to be positive. We still don't have a travel date. It's driving me nuts. Mainly because we were told to expect to be traveling by the end of February/beginning of March. That's traveling by then...not getting a travel date. So since we don't even know our date yet I'm really not expecting to travel until April at the earliest and who even knows if it will be then. I'm getting so tired of people asking if we've heard anything yet. I know they mean well; they mean very well. They are concerned and I hate feeling upset when they ask. But every time someone asks it makes me think about the fact that we have no idea when we will travel. Believe me, when we know something I will be shouting it from the rooftops. There may be a breaking news story about a lunatic in Alabama climbing to the top of the RBC building (it's the tallest building in town; all 8 stories of it) shouting through a loudspeaker. I'm struggling with my faith in the process. Lots of doubts are creeping in and I'm really wrestling with why Sarge is still sitting in an orphanage with no parents when there are two loving parents and a whole family of extended relatives who desperately want him home. Plus I'm hearing a lot of negative adoption stories right now and that's just adding to the doubt. I know it's from Satan. I know God wants Sarge home with us. But I know bad things happen and I'm struggling with thinking the worst. So I just don't think about it at all. I've found myself avoiding thinking about the adoption at all. I have this sort of magical thinking that if I worry about the worst thing happening, it will. Or if I get my hopes up that we will get a travel date, say, today, then we definitely won't get it today. So I'm intentionally suppressing any thoughts about the adoption. It's making it hard to even pray about it because that makes me think about it and then I start to worry. Patience has never been my strong suite. I am horribly impatient. So that's really not helping the situation at all. But I don't want to pray for patience because I'm afraid I'll jinx the whole process and make it take longer. I know that isn't the way God works. See what I mean by the faith struggle??? So pray for me. Pray for us. Pray for Sarge. Pray for the Minister of Education who has our paperwork. Pray for our facilitator who will give us our travel date. Pray that they move quickly. 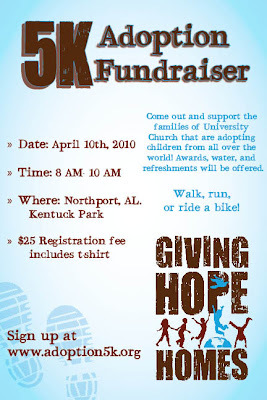 ...and anyone else who wants to come to town for the Adoption Fundraiser 5K! Just click the picture below to register. Email me if you need more information or directions!